Gormenghast | The Novels | Who Was Mervyn Peake? Mervyn Peake, a man of many talents, a creative virtuoso, and an eccentric genius, had a profound and singular interior idea. His work has frequently been compared to that of Dickens, albeit an off-center Dickens with a fantasy element. But the name "Mervyn Peake" is relatively unknown in the United States. His books have been translated into many languages and have achieved a kind of cult status in England, while in America few have heard of the kingdom of Gormenghast. Peake was born in Kuling, China, in 1911 to English missionary parents, Ernest Cromwell Peake, a doctor, and Elizabeth (Powell) Peake. He spent his childhood in Tientsin in the North, surrounded by the fragile milieu and destitution of an exotic country in the thick of a collapsing imperial dynasty. China, an ancient country of rich tradition and dense ritual, made a lasting impression on him. At the age of 12 he returned to England with his family (never to return to China) and attended Eltham College in Kent, Croydon School of Art, and, from 1929 to 1933, the Royal Academy Schools. He exhibited his paintings for the first time in 1931. When a former professor from Eltham invited him to join the artists' colony on Sark, a tiny island in the English Channel, Peake moved promptly. He lived and worked there from 1933 to 1935, exhibiting his paintings yearly in London. By all accounts he cut a tall and handsome figure on the island, a charming and eccentric artist. But he needed to make a living, and so, in 1936, Peake began teaching at Westminster School of Art. It was there he met and wooed his muse, the painter Maeve Gilmore. They were married in 1937 when she was 19 and he was 26. Together Maeve and Mervyn had three children: Sebastian (born in 1940), Fabian (1942), and Clare (1949). The Peakes were devoted parents. Clare remembered that during her childhood "a rich and anarchic sense of humor and a passionate belief in the importance of poetry and painting, love and kindness, were paramount." Before he wrote "the Titus books," as he called them, Mervyn Peake was a noted illustrator of classic children's books including Treasure Island and Alice's Adventures in Wonderland. His in-depth study of renowned illustrators (including William Hogarth, George Cruikshank, Albrecht Dürer, William Blake, Gustave Doré, and Francisco de Goya) served as the foundation for his own work. His illustrations are now highly sought after. In 1945, as a war artist, Peake was one of the first civilians to enter the German concentration camp at Belsen. He was intensely affected by the event and was left with deep impressions of the victims of the war. Startling and disturbing paintings and poems resulted from that traumatic experience. Biographer John Watney wrote, "For years he had drawn strange worlds. Now he was seeing, in its reality, a monstrous world more terrible than any he could have imagined...."
In 1946, the Peakes moved to Sark, living in a huge old house without electricity or running water. Despite the inconveniences, it was a blissfully happy time for them all -- Peake worked on his paintings, drawings, and Gormenghast, and the children lived a life of adventure and exploration, free from the dangers of traffic on the car-free island. Gormenghast, the second "Titus" book, was published in 1950. It received some excellent reviews and Peake was awarded the Royal Society of Literature prize (£100) for Gormenghast (and a volume of poetry, The Glassblowers). The need for a steady income again necessitated the Peakes' return to London. Mervyn taught part time at the Central School of Art, and in 1953, after the death of his father, moved his family to his parents' house south of the city. Peake wrote and struggled to produce a play, The Wit to Woo, which opened in 1957, but ran for only a brief time. This undertaking presaged a rapid decline in Peake's health. He was first diagnosed as having a nervous breakdown and spent the next 12 years struggling with poor health while doctor after doctor struggled for a diagnosis. In the search for a cure, he underwent electric shock treatments and had an operation on his brain. In fact, he had Parkinson's disease allied with Encephalitis Lethargica, or 'sleeping sickness,' which he had contracted in 1911 during the epidemic that had swept the part of China where he was born. In his case it lay dormant for over thirty years. When it became impossible for Maeve to care for him at home, he was moved to institutions, finally dying in November of 1968, at the age of 57, in a hospice in Burford, near Oxford, run by Maeve's caring younger brother Dr. James Gilmore. Clare remembers Peake as "a kind and loving father... generous, sweet, and innocent," with an "open, trusting disposition." 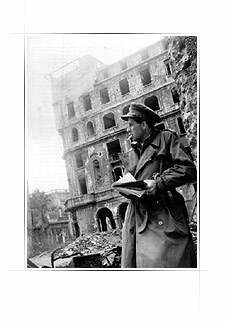 And Tom Pocock, the writer with him at Belsen, is quoted in John Batchelor's study Mervyn Peake, as saying, "His dark, somber good looks and the deep-set, troubled eyes might have belonged to a most forceful person. But he was intensely gentle ... a delightful and generous companion." In the fall of 2001, Letters from a Lost Uncle (with an introduction by Louis de Bernieres) and Captain Slaughterboard (introduction by Maurice Sendak) are being republished (by Methuen and Walker Books, respectively). New editions of Peake's illustrated Alice's Adventures in Wonderland (introduction by Will Self) and Through the Looking-glass and What Alice Found There (introduction by Zadie Smith) will be published in September of 2001 by Bloomsbury. Daniel, Estelle. The Art of Gormenghast: The Making of a Television Fantasy, HarperCollins Entertainment, London, 2000. Batchelor, John. Mervyn Peake: A Biographical and Critical Exploration, Duckworth, London, 1974. Gardiner-Scott, Tanya J. Mervyn Peake: The Evolution of a Dark Romantic, Peter Lang, New York, 1989. Peake, Sebastian and Maeve Peake. Mervyn Peake: Two Lives, Vintage, 1999. Watney, John. Mervyn Peake, Michael Joseph, London, and St. Martin's Press, New York, 1976. Winnington, G. Peter. Vast Alchemies: The Life and Work of Mervyn Peake, Peter Owen, London, 2000. Yorke, Malcolm. Mervyn Peake: My Eyes Mint Gold, John Murray, 2000. A small and varied selection of World Wide Web resources relating to Mervyn Peake and his work.